A forum for the exploration of ideas. Our thanks to all Veterans! Our Flag is still flying! I spotted this flag flying over a quiet community baseball field this morning. It’s tattered appearance brought to mind the Star Spangled Banner and images I recall associated with the inital inspiration for Francis Scott Key or memories I have of the movies and community events when the song has been played and sung. O’er the ramparts we watched, were so gallantly streaming. Is the American flag still waving? Yes! Do we appreciate the dedication and sacrifices of people who have kept us free? Absolutely! We got through the election. 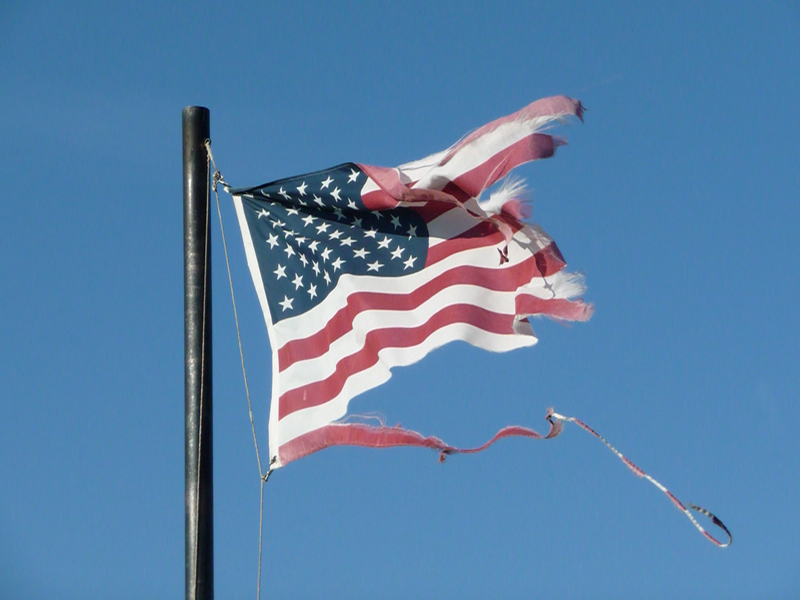 Our flag is still flying, but it is hard to feel confident that the right changes have taken place. Did the recent political campaigns raise your blood pressure? Did the attack-the-opponent strategy make you tired? sad? angry? frustrated? Democrats … once known as a party of inclusion … can’t develop a unified message to its members or the Nation. Republicans … under the guise of fiscal conservatism … strangle any legislative efforts to help the vicitims of the their laissez-faire economics. Every politician seems to be more concerned about their own interests and those of their friends (duh, big surprise) rather than being willing to work together to get our country back on solid footing. How will these approaches heal and protect the USA? On top of that, we have”The Party of No” trying to paint more states red and many of the voters responsible for the blue and purple states failing to show up at the mid-term elections. How does “leaving the decision to others” preserve our democracy? We still face a lot of serious issues. We still have 2 Wars … and others seem to be pending. How do we protect the USA and support our allies without bankrupting the country? Unemployment remains at an incredibly high level. What can be done to create jobs? Foreclosures and an underemployed construction industry showcase terrible weaknesses in our economic condition. Over-worked employees who have survived as friends and co-workers have been laid off wonder when the pressure will be reduced. Do you wonder why America has become so tattered? Enter your email address to subscribe and receive New Thoughts by email. The "Pursuit of Happiness" is the source of most Unhappiness.